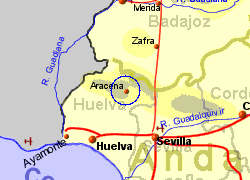 The town of Aracena lies approximately 80Km from the cities of Huelva and Sevilla, and 40Km from the Portuguese border. 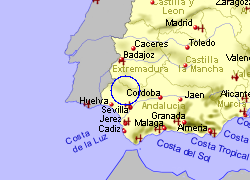 The town, located in the Parque Natural Sierra de Aracena y Picos de Aroche, is home to the Gruta de las Maravillas (The Cave of Marvels), one of the most impressive cave systems in Spain, located in the hill below the ruins of the 13th century castle, which has recently been restored. The 12 caves with underground lakes and interconnecting passage ways, are open to visitors, and illuminatedn to emphasize the coloured minerals present. Aracena also boasts a number of historic buildings and a museum featuring the history and traditions of ham production in the area. 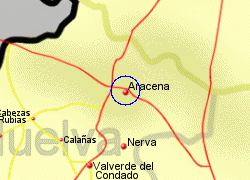 Map of the Aracena area.